The 2018 Ontario general election was held on June 7, 2018, to elect the 124 members of the 42nd Parliament of Ontario. The Progressive Conservative Party of Ontario, led by Doug Ford, won a majority government with 76 of the 124 seats in the legislature. The Ontario New Democratic Party, led by Andrea Horwath, formed the Official Opposition. The Ontario Liberal Party, led by incumbent Premier Kathleen Wynne, lost official party status in recording both the worst result in the party's 161-year history and the worst result for any incumbent governing party in Ontario. The Green Party of Ontario won a seat for the first time in their history, while the Trillium Party of Ontario lost its single seat gained by a floor-crossing during the 41st Parliament. Twenty-four other parties and numerous independent candidates also received votes. Popular vote by riding. As this is an FPTP election, seat totals are not determined by popular vote, but instead by the result in each riding. Riding names are listed at the bottom. The Electoral Boundaries Act, 2015 increased the number of electoral districts from 107 to 122, following the boundaries set out by the federal 2013 Representation Order for Ontario, while preserving the special boundaries of the 11 seats in Northern Ontario set out in the 1996 redistribution. The Far North Electoral Boundaries Commission, appointed in 2016, recommended the creation of the additional districts of Kiiwetinoong and Mushkegowuk—James Bay, carved out from the existing Kenora—Rainy River and Timmins—James Bay ridings, which accordingly raised the total number of seats to 124. This was implemented through the Representation Statute Law Amendment Act, 2017. The new districts have been criticized as undemocratic, as they have a population of around 30,000 people compared with over 120,000 people in some southern Ontario constituencies. National Post columnist Josh Dehaas suggested that the small population sizes of the ridings might violate the Canadian Charter of Rights and Freedoms. In September 2017, a research firm analyzed the impact of redistribution if the boundaries had been in effect for the previous election. Under legislation passed in 2005, Ontario elections were to be held on "the first Thursday in October in the fourth calendar year following polling day in the most recent general election", subject to the Lieutenant-Governor of Ontario's power to call an election earlier. As the current government had a majority, the passage of a non-confidence motion was not a likely option for calling an early election, though Premier Kathleen Wynne stated in June 2015 that she would likely advise to dissolve the Legislature in spring 2018 rather than in October of that year in order to avoid any conflict with municipal elections and take advantage of better weather and longer days. To put this on a statutory footing, in October 2016 Attorney General of Ontario Yasir Naqvi introduced a bill in the Legislative Assembly which, in part, included moving the election date to "the first Thursday in June in the fourth calendar year following polling day in the most recent general election", and it came into effect in December 2016. The Ontario Liberal Party attempted to win their fifth consecutive general election, dating back to 2003. The Progressive Conservative Party of Ontario won their first election since 1999, and the Ontario New Democratic Party attempted to win their second election (having previously won in 1990). Numerous other extra-parliamentary political parties also vied for votes. The Liberals under Kathleen Wynne headed into the 2018 campaign trailing far behind the Progressive Conservatives, led by former Toronto City Councillor Doug Ford. The Liberals' standing with voters had been badly hurt when they partially privatized Hydro One in 2015, after campaigning against it in the 2014 election, as well as rising criticism over "ballooning provincial debt, high electricity prices and costly, politically expedient decisions". 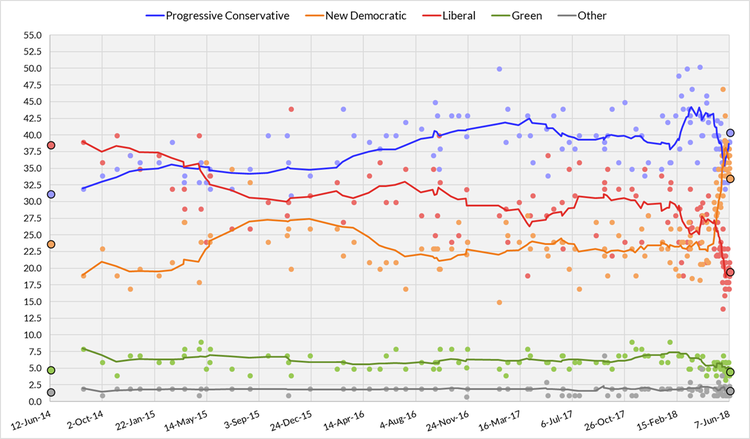 In early April, the CBC published their analysis of aggregate polls showing that Ford and the Progressive Conservatives were ahead of the other parties averaging 42.1% support, compared to 27.2% for the governing Liberals, 23.4% for the NDP and 5.7% for the Greens and with 11 Liberal MPPs announcing they would not be running for re-election or having already resigned their seats in the months leading up to the election. According to Wynne, voters were offered a "stark choice", between "cutting and removing supports from people" with "billions in cuts", which she alleged the Progressive Conservatives would do if they won the election, and expanding investments in social programs such as prescription drugs and childcare, which the Liberal platform promised. In March 2018, the Liberals tabled a pre-election budget in the provincial legislature which promised billions of dollars in new spending for free childcare and expanded coverage for dental care but replaced the government's previous balanced budget with a $6.7 billion deficit projected to last until 2024–2025. PC leader Doug Ford called the budget a "spending spree". According to Toronto Star columnist Susan Delacourt, voters were motivated by a desire for change—such desire being more driven by emotion than by ideology—and one researcher estimated that more than half of the electorate was undecided in who they were likely to vote for. The Huffington Post reported that half of voters were basing their vote intentions on how best to block the party they oppose. Elections Ontario used electronic vote tabulator machines from Dominion Voting Systems for counting the ballots. Tabulators were deployed at 50 per cent of polling stations at a cost of CA$32,000,000. This election was the first time Ontario used vote counting machines for a provincial election, although tabulators have been used in Ontario civic elections for more than 20 years, and also in a 2016 by-election in Whitby-Oshawa. The original paper ballots marked by voters will be kept for a year along with the digital scans of each ballot by the tabulator. The percentage of votes cast for the Progressive Conservatives by riding. The percentage of votes cast for the NDP by riding. The percentage of votes cast for the Liberals by riding. Change in Progressive Conservative vote share by riding compared to the 2014 Ontario election. Each dot represents five-thousand votes for the party of the associated colour. Data is based on individual riding results. Dots are placed at random positions within the ridings that they belong to. June 12, 2014 The Liberal Party under Kathleen Wynne wins a majority government in the 41st Ontario general election. Progressive Conservative leader Tim Hudak announces his intention to step down following the selection of his successor. July 2, 2014 Tim Hudak resigns as leader of the Progressive Conservatives. Simcoe—Grey MPP Jim Wilson is named interim leader. July 24, 2014 The Liberals pass their May 1 budget in its final reading. May 9, 2015 Patrick Brown, the Conservative federal MP for Barrie, is elected leader of the Progressive Conservative Party. September 24, 2015 Ontario Provincial Police lay charges in relation to the Sudbury by-election scandal. November 1, 2016 Ontario Provincial Police announce charges under the provincial act against Gerry Lougheed and Patricia Sorbara (CEO and director of the 2018 Liberal campaign) for alleged bribery during a 2015 byelection. Sorbara announced that she will step down from the campaign. January 24, 2018 CTV News reports that Progressive Conservative Party leader Patrick Brown is accused by two women of committing sexual misconduct. Brown denies the allegations. January 25, 2018 Patrick Brown resigns as leader of the Progressive Conservative Party. January 26, 2018 Progressive Conservative Party caucus chooses Nipissing MPP Vic Fedeli as interim leader. March 10, 2018 Doug Ford is elected leader of the Progressive Conservatives on the third ballot of the party's leadership election. Fedeli continues as Leader of the Opposition for legislative purposes until the election due to Ford not having a seat in the Legislature. April 11, 2018 First Leaders Debate hosted by the Jamaican Canadian Association. Andrea Horwath, Mike Schreiner, and Premier Kathleen Wynne were in attendance. Doug Ford chose not to attend. April 16, 2018 The Ontario NDP release their full election platform. May 9, 2018 Electoral Writ issued. May 11, 2018 Leaders' debate in Parry Sound. May 17, 2018 Candidate nominations close at 2 PM local time. May 26, 2018 Advance voting starts at voting locations and returning offices. May 27, 2018 Second televised debate, moderated by Steve Paikin and Farah Nasser, held at the Canadian Broadcasting Centre in Toronto and aired on CBC, CTV, Global, TVO, CPAC, CHCH and other outlets. Attended by Wynne, Ford, and Horwath. May 30, 2018 Advance voting ends at advance voting locations. June 1, 2018 Advance voting ends at returning offices. June 2, 2018 Premier Wynne concedes that the Liberals will not win the election. June 6, 2018 Special ballot voting at returning office or through home visit ends at 6:00 PM EST. June 7, 2018 Election day. Fixed-date of the 2018 provincial election. The Province will have a deficit in the government's first year. Based on Ford's campaign promises, economists estimate there will be five consecutive deficits between $8 billion and $6 billion. An audit will be conducted into the previous government's spending. There will be five consecutive deficits of between $5 billion and $2 billion. █ Liberal "Care over cuts"
█ PC "For the People"
█ Green "People Powered Change"
█ Libertarian "The Party of Choice"
In February 2018, the PC leadership overturned the nomination of candidates Karma Macgregor in Ottawa West—Nepean and Thenusha Parani in Scarborough Centre because of irregularities and allegations of ballot stuffing at their nomination meetings. Both candidates denied these claims. The nomination meetings were reorganized, and both candidates lost the nomination at those meetings. However, the PC leadership decided not to overturn the nomination meeting's result in Hamilton West—Ancaster—Dundas, where a similar situation took place, because of an ongoing police investigation on this situation. In March 2018, the NDP nominated Lyra Evans as their candidate in Ottawa—Vanier. Evans was the first openly transgender candidate nominated by a major party to run in an Ontario general election. Kitchener-Conestoga Michael Harris – Mike Harris Jr.
Evolution of voting intentions during the 2018 Ontario provincial election campaign. Plot generated in R from data in the table below. Trendlines are local regressions, with polls weighted by proximity in time and sample size. 95% confidence ribbons represent uncertainty about the regressions, not the likelihood that actual election results would fall within the intervals. Ten-poll average of Ontario opinion polls from June 12, 2014, to the last possible date of the next election on June 6, 2018. Each line corresponds to a political party. ^ a b Ferguson, Rob (October 19, 2016). "Ontario moves election date to June 7, 2018". Toronto Star. Retrieved October 31, 2016. ^ "Report: Far North Electoral Boundaries Commission". August 8, 2017. ^ Benzie, Robert (August 8, 2017). "Ontario to get 17 new ridings, including a constituency that is largely Indigenous". Toronto Star. Retrieved December 10, 2017. ^ "Ontario Liberals' plan for two new ridings could violate the Charter and cost PCs the election". National Post. August 3, 2017. Retrieved January 13, 2017. ^ "Public Opinion Research: Ontario This Month" (PDF). innovativeresearch.ca. Innovative Research Group. September 2017. pp. 17–23. ^ Benzie, Robert (June 4, 2015). "Ontario to add 15 MPPs, move 2018 election date ahead". Toronto Star. Retrieved October 25, 2015. ^ Blackwell, Tom (June 7, 2018). "How a historic Liberal collapse and PC upheaval turned Ontario election into a wild horse race". National Post. Retrieved June 12, 2018. ^ Hepburn, Bob (May 30, 2018). "The day Kathleen Wynne lost the 2018 election". Toronto Star. Retrieved June 12, 2018. ^ Grenier, Eric (April 6, 2018). "With nine weeks to go, the Ontario election is Doug Ford's to lose". CBC News. Retrieved April 7, 2018. ^ Crawley, Mike (April 7, 2018). "11 Liberals won't run in Ontario election, and that's a problem for Kathleen Wynne". CBC News. Retrieved April 7, 2018. ^ Rushowy, Kristin (March 12, 2018). "Ontario voters facing 'stark choice' in June, says Kathleen Wynne". Toronto Star. Retrieved April 7, 2018. ^ Jeffords, Shawn; Loriggio, Paola (March 28, 2018). "Ontario budget 2018: Liberals run deficit, introduce new spending in pre-election budget". Global News. Canadian Press. Retrieved April 7, 2018. ^ Watt, Jaime (April 1, 2018). "Veering left is right for Kathleen Wynne". Toronto Star. Retrieved April 7, 2018. ^ Delacourt, Susan (May 29, 2018). "What is it that is driving Ontario voters?". The Toronto Star. ^ Omer, Mohammed (May 30, 2018). "Ontario Election 2018: Poll Finds Half of Decided Voters Making Choice Based on Party They Dislike". HuffPost. ^ Yufest, Eli (February 2018). "Analysis of Voter Support Ceilings for Major Ontario Parties". Campaign Research. ^ Yun, Tom (June 7, 2018). "Ontario's experiment with vote-counting machines could change elections to come". Macleans. ^ a b Reevely, David (June 7, 2018). "Elections Ontario has 'utmost confidence' in new vote-counting machines but also has backup plan". Ottawa Citizen. ^ "Province-Wide Election Night Results". Elections Ontario. Archived from the original on June 8, 2018. Retrieved June 10, 2018. ^ "Ontario election 2014: Tim Hudak to step down". CBC News. June 12, 2014. Retrieved June 12, 2014. ^ Benzie, Robert (June 18, 2014). "Tim Hudak to quit July 2 amid Tory revolt". Toronto Star. Retrieved June 18, 2014. ^ Brennan, Richard (July 2, 2014). "Progressive Conservatives pick Jim Wilson as interim leader". Toronto Star. Retrieved July 2, 2014. ^ "Barrie MP Patrick Brown resigns seat as he shifts to lead provincial PCs". Ottawa Citizen. May 13, 2015. Retrieved May 18, 2015. ^ "Gerry Lougheed Jr., Ontario Liberal fundraiser, charged in Sudbury byelection scandal". CBC News. September 24, 2015. Retrieved September 26, 2015. ^ Ferguson, Rob; Benzie, Robert (October 31, 2016). "Top Liberals face Elections Act charges in Sudbury case". Toronto Star. Retrieved November 1, 2016. ^ Benzie, Robert; Ferguson, Rob (November 1, 2016). "Wynne adviser to step down after OPP charges related to Sudbury byelection". Toronto Star. Retrieved November 1, 2016. ^ Aiello, Rachel; McGregor, Glen (January 24, 2018). "Patrick Brown denies sexual misconduct allegations from two women, resigns as Ontario PC leader". CTV News. ^ Crawley, Mike (January 25, 2018). "Patrick Brown resigns as Ontario PC leader after sexual misconduct allegations". CBC News. ^ "Statement from Ontario PC Leader Patrick Brown" (Press release). Progressive Conservative Party of Ontario. January 25, 2018. ^ "Vic Fedeli chosen as interim leader of Ontario PCs with election looming". CBC News. January 26, 2018. Retrieved January 26, 2018. ^ "Doug Ford named new Ontario PC leader". CTV News. Canadian Press. March 10, 2018. Retrieved March 21, 2018. ^ "Ford 'the boss': Fedeli". Sudbury Star. Postmedia Network. March 11, 2018. Retrieved March 14, 2018. ^ Walsh, Marieke (April 5, 2018). "Doug Ford bails on first Ontario election leaders debate". iPolitics. Retrieved April 12, 2018. ^ "Andrea Horwath's Change for the Better". Ontario NDP. Retrieved April 18, 2018. ^ "Ford, Horwath, Wynne to face off in Toronto-focused CityNews debate May 7". CityNews. April 20, 2018. Retrieved April 21, 2018. ^ "Election 101: Here's what you need to know about the Ontario election". cbc.ca. May 9, 2018. ^ Bissonette, Sarah (May 7, 2018). "Wynne, Ford and Horwath debate in Parry Sound Friday". parrysound.com. ^ Blackwell, Tom (May 16, 2018). "Ontario PC candidate resigns after private 407 freeway confirms 'internal theft' of data on 60,000 customers". National Post. ^ a b c d "Advance voting begins for provincial election". ctvnews.ca. May 26, 2018. ^ "Advance Voting for Provincial General Election Starts Today" (PDF). elections.on.ca. Retrieved May 27, 2018. ^ "Kathleen Wynne, Doug Ford, Andrea Horwath invited to face off in televised debate on May 27". CBC News. April 12, 2018. Retrieved April 12, 2018. ^ Benzie, Robert (June 2, 2018). "Wynne concedes she will lose Thursday's election, urges voters to elect Liberal MPPs as check on Ford or Horwath". Toronto Star. ^ Giovannetti, Justin (June 3, 2018). "Ontario's NDP, PCs jockey for majority in wake of Wynne's early concession". The Globe and Mail. ^ "Ontario election guide: What you need to know before you vote". The Globe and Mail. May 15, 2018. ^ "Platforms For Ontario Election: The Promises Each Party Made To Voters". HuffPost. Canadian Press. June 6, 2018. ^ "Platform tracker: Party promises and policies on issues that mean most to Ontario voters". CBC News. ^ "Doug Ford's Plan is Furthest Away From a Balanced Budget". CTV News. May 30, 2018. ^ Streck, Aaron (June 1, 2018). "Durham highway tolls will be removed if elected, say NDP candidates". Global News. Retrieved June 7, 2018. ^ Akin, David (May 18, 2018). "For the Wynne Liberals, the Ontario election has always been 'Save the Furniture'". Global News. ^ "Doug Ford, Ontario PCs unveil campaign bus and 'For The People' slogan". CityNews. Toronto. April 15, 2018. ^ Jarvis, Anne (June 1, 2018). "Ford tells supporters in Windsor 'help is on the way'". Windsor Star. ^ Powers, Lucas (April 16, 2018). "Ontario NDP platform proposes big spending on health care, social services". CBC News. ^ "La plateforme néo-démocrate est enfin disponible en français". Ici Radio-Canada Première (in French). April 26, 2018. ^ Janus, Andrea (May 14, 2018). "Basic income, road tolls for transit part of Ontario Green Party's election platform". CBC News. ^ Small, Allen (May 18, 2018). "Ontario Libertarian Party leader Allen Small shares his views on election issues". Global News (Interview). Interviewed by Tasha Kheiriddin. Toronto. ^ "Of choices we have, Ford's PCs are best". The London Free Press. Postmedia Network. June 1, 2018. ^ "Our choice for Ontario is Ford". Toronto Sun. Postmedia Network. June 2, 2018. ^ "Ontario's choice is clear, if less than ideal: A Progressive Conservative government". National Post. Postmedia Network. June 1, 2018. ^ "The Progressive Conservatives should form the next Ontario government". Ottawa Citizen. Postmedia Network. June 2, 2018. ^ "Change is needed in Ontario". Ajax News Advertiser. May 31, 2018. ^ Ryu, Mika. "Editorial: PCs Are the Only Real Choice". The Post Millennial. ^ "Ontario voters should back NDP to stop Doug Ford". Toronto Star. June 1, 2018. ^ a b "The Spectator's view: Ford PCs say take them on faith – that's not enough". The Hamilton Spectator. Metroland Media Group. June 5, 2018. Retrieved June 6, 2018. ^ Jury, Pierre (June 5, 2018). "Pour le NPD" [For the NDP]. Le Droit (in French). ^ Toronto Star Editorial Board (May 22, 2018). "Guelph voters should consider making history and sending the Greens' Mike Schreiner to Queen's Park". Toronto Star. Retrieved March 16, 2019. ^ "Globe editorial: For Ontario voters, leadership and vision are not on offer". The Globe and Mail. June 5, 2018. ^ "The Record's view: In an era of disruption Ontario voters should seek stability". Waterloo Region Record. June 4, 2018. Retrieved June 6, 2018. ^ "Editorial: We're endorsing change this provincial election". Northern Life. Laurentian Media Group. May 31, 2018. Retrieved June 7, 2018. ^ Walsh, Marieke (May 4, 2018). "Trudeau dropping in on Wynne days before election campaign". iPolitics. Retrieved June 5, 2018. ^ Rushowy, Kristin; Benzie, Robert; Ferguson, Rob (May 24, 2018). "Hazel McCallion stars in 'A Tale of Two Endorsements'". Toronto Star. ^ "Andrew Scheer says Doug Ford 'best choice' in election, slams Ontario NDP's past". Global News. May 24, 2018. Retrieved May 24, 2018. ^ Raza, Ali (May 30, 2018). "Hazel McCallion endorses PC Leader Doug Ford and Liberal Finance Minister Charles Sousa". The Mississauga News. Retrieved May 30, 2018. ^ Maloney, Ryan (June 4, 2018). "Kevin O'Leary Taps 'Sharks' To Help Pay Back Tory Leadership Debt". HuffPost. Retrieved June 4, 2018. ^ Artuso, Antonella (June 1, 2018). "'HE'S A STRAIGHT SHOOTER': Mel Lastman endorses Doug Ford". Toronto Sun. ^ Harper, Stephen [@stephenharper] (May 28, 2018). "A year since @CPC_HQ elected @AndrewScheer as Leader, I can think of no one better to be Canada's next Conservative Prime Minister. Great seeing Andrew in Toronto, we both agree we must first get the job done in Ontario with Conservative Premier @fordnation!" (Tweet). Retrieved June 7, 2018 – via Twitter. ^ Janus, Andrea (May 21, 2018). "Andrea Horwath, Jagmeet Singh team up at Brampton event to keep pushing NDP in polls". CBC News. Retrieved June 5, 2018. ^ a b c d e f g h i Coren, Michael; Dias, Jerry; Farber, Bernie M.; Gardner, Kay; Hudson, Sandy; Miller, David; Pascale, Charles; Rebick, Judy; Wong-Tam, Kristyn. "It's Time For Progressive Voters To Rally Around Andrea Horwath". HuffPost. Retrieved June 6, 2018. ^ Chow, Olivia [@oliviachow] (May 22, 2018). "After June 7, life will be more affordable and hopeful. @AndreaHorwath message of #Change4Better is getting through" (Tweet). Retrieved June 7, 2018 – via Twitter. ^ a b Ponciano, Carmen (April 22, 2018). "Mike Schreiner hosts rally in Guelph with David Suzuki, Elizabeth May". CBC News. ^ Ontario Convenience Stores Association [@OntarioCStores] (June 2, 2018). "Small businesses need a business friendly government going forward as we have been ignored for years" (Tweet). Retrieved June 2, 2018 – via Twitter. ^ "Ottawa police union endorses PCs". CBC News. May 31, 2018. Retrieved May 31, 2018. ^ White, Erik (May 31, 2018). "Sault Ste. Marie Steelworkers take flack for backing PC candidate: 'this is democracy'". CBC News. Retrieved May 31, 2018. ^ Alphonso, Caroline (May 10, 2018). "Ontario's largest education union opts to endorse NDP over Liberals". The Globe and Mail. Retrieved June 1, 2018. ^ "Canada's NDP: Working together". CUPE. Retrieved June 2, 2018. ^ "Ontario Steelworkers Endorse Andrea Horwath and the NDP". Newswire. Retrieved June 3, 2018. ^ "ATU Canada Endorses the NDP" (PDF). ATU (Press release). Retrieved May 15, 2018. ^ "Party overturns Ottawa West-Nepean PC nomination". CBC News. February 9, 2018. Retrieved May 31, 2018. ^ "PCs to hold new nomination contests in Ottawa West-Nepean, Scarborough Centre". Ottawa Citizen. Canadian Press. February 9, 2018. Retrieved May 31, 2018. ^ Benzie, Robert (February 9, 2018). "Tories overturn two controversial nominations, as they clean house in post-Patrick-Brown era". Toronto Star. Retrieved May 31, 2018. ^ "NDP candidate hopes to give LGBT community greater voice at Queen's Park". CBC News. March 26, 2018. Retrieved May 13, 2018. ^ McCooey, Paula (March 26, 2018). "NDP in Ottawa-Vanier nominate Ontario's first transgender candidate for MPP". Ottawa Citizen. Retrieved May 13, 2018. ^ Paikin, Steve [@spaikin] (May 5, 2017). "Confirmed: speaker @DaveLevac announces he won't seek re-election in June 2018" (Tweet) – via Twitter. ^ a b c Benzie, Robert (April 5, 2018). "Liberal cabinet ministers Michael Chan and Tracy MacCharles, MPP Grant Crack say they are retiring". Toronto Star. ^ a b Ferguson, Rob (October 6, 2017). "Two more Wynne cabinet ministers say they won't run again in next June's Ontario election". Toronto Star. ^ Walters, Jeff (November 21, 2017). "Sarah Campbell to leave politics; Greg Rickford to run in Kenora - Rainy River". CBC News. Retrieved January 12, 2018. ^ Harris, Michael [@Michaelharrispc] (April 7, 2018). "Please see my statement below" (Tweet). Retrieved May 19, 2018 – via Twitter. ^ Kennedy, Brendan (June 7, 2018). "NDP's Bhutila Karpoche wins Parkdale-High Park, becoming first Tibetan ever elected to public office in North America". Toronto Star. ^ Paikin, Steve [@spaikin] (April 25, 2018). "Veteran @OntLiberal MPP harinder takhar announces he won't run again" (Tweet) – via Twitter. ^ Benzie, Robert (September 8, 2017). "Brad Duguid won't run in 2018 provincial election". Toronto Star. ^ "Former PC leader Patrick Brown not running in Ontario election". CBC News. Canadian Press. March 15, 2018. Retrieved March 16, 2018. ^ Forsyth, Paul (January 3, 2018). "Cindy Forster pledges to keep fighting for causes she believes in". niagarathisweek.com. Retrieved January 12, 2018. ^ nurun.com. "UPDATED: Cindy Forster calling it quits". St. Catharines Standard. Retrieved January 12, 2018. ^ "Monte Kwinter MPP for York Centre not seeking re-election in 2018" (Press release). Ontario Liberal Party. July 20, 2017. ^ "Julia Munro Announces Intention to Retire" (PDF). juliamunrompp.com (Press release). March 21, 2017. Archived from the original (PDF) on March 22, 2017. ^ Zochodne, Geoff [@GeoffZochodne] (July 10, 2017). "Longtime Liberal @MarioSergioMPP is hanging them up" (Tweet) – via Twitter. ^ "The third and final televised debate of the provincial election campaign in Toronto". CBC Television. May 27, 2018. ^ a b "Ontario Provincial Election 2018: CityNews Leaders' Debate". City. May 7, 2018.